After a long day of travel through pristine lakes and dense forest, we make our main camp on Long Island Lake in the Boundary Waters Canoe Area Wilderness. I grew up in a different Long Island, the one outside New York City, a densely populated suburb where at night I lay on the blacktop of the dead end outside our split-level house, dreaming of places as wild as this. As a kid, I canoed in lazy circles on a man-made lake near the city, seven acres in size compared to the Boundary Waters’ cool million. I would paddle to the edge of that lake until I became ensnarled in weeds and lily pads, and imagine that the marshy spot led somewhere, anywhere else. In the Boundary Waters, this childhood daydream is realized. These lakes are all interconnected, like we are. They lead into Canada, all the way across North America, and merge with the Atlantic, Pacific and Arctic Oceans. All this water, and the way it is connected, is what makes this place at once beautiful and vulnerable. As easily as we pass through the lakes and forests, so, too, can the chemicals we unleash. 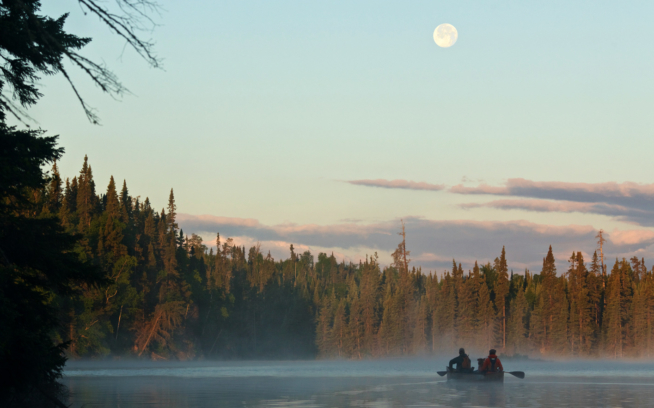 The time to save the Boundary Waters is now. The United States Forest Service is currently seeking public input regarding renewal of two expired mineral leases held by Twin Metals. Please urge the USFS to deny renewal of these leases by July 20, 2016. Comments may be emailed to TwinMetalsLeaseInput@fs.fed.us. For more information on this issue, and to sign a petition urging the USFS to deny the leases, please visit savetheboundarywaters.org. By sharing what they witness through blogs and social media, the Freemans are bringing others along on their journey. Powering their devices with the sun, they “speak loudly for a quiet place” by recording podcasts and sharing images. It was a single one of those images that made me want to bear witness for myself. Bearing witness is as much about what we don’t see as what we do. After our first portage, we don’t see a single sign of civilization, besides a fire grate or a latrine, for five days. In that time, we briefly see four other human figures silently passing in the distance, and at least ten times as many loons. I measure the days in colors rather than hours. Silver moonlight when I tiptoe outside my tent at night, then first-light navies and mauve dawns. The butter-yellow sunrise gives way to the bright whites of day, shadowed gray by storms that threaten, but don’t always arrive. The rainbow, comprised solely of green, in the leaves of the boreal forest. Rosy light during a golden hour that’s more like two. The sky blues, then blackens, and then there is only white moonlight rippling on black water, and even with the moon high and full, more stars than I knew existed. One night, Nate, Matt and I lie on rocks on the edge of Long Island and watch a lightning storm on the horizon. Then, layers of clouds part like curtains to reveal the full moon and its moonbow. The experience flows between us as easily as water, and without words, I feel connected to my friends, to everything. The lakes are connected by paths through the woods called portages. The canoe and everything in it must be carried from one lake to the next. There is a hidden pleasure in the portage, which, in homage to my New York roots, we rename a schlep. When you make the trip in one direction, carrying all that weight, the trip back unburdened makes a gift of lightness. As the days pass, I start to feel more at home on this Long Island than I ever did in the one I came from. When Dave says, “This wilderness belongs to all of us,” I believe him. Or maybe it’s more that I belong to it. Drinking water so pure it doesn’t really need to be filtered, I become more than half Boundary Water. Lakes are the places where, E.B. White wrote in “Once More to the Lake,” we experience the “pattern of life indelible, the fade proof lake, the woods unshatterable, the pasture with the sweet fern and the juniper forever and ever, summer without end.” In my passage through this place I feel a part of that infinity, yet painfully aware of its opposite. This place is not unshatterable. It does not go on forever and ever, without constant, vigilant effort to simply make sure it is left alone. 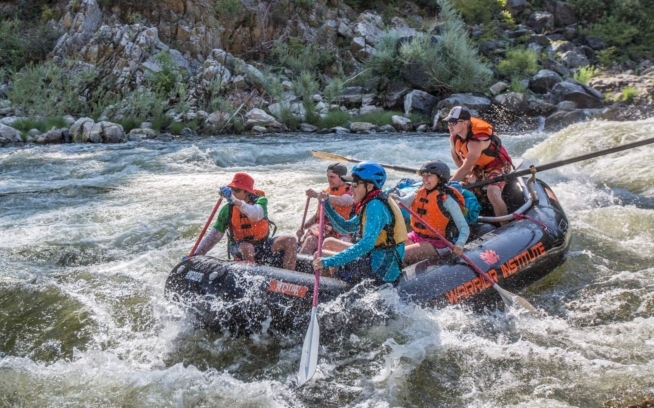 When they asked the last generation of explorers why they went up or down or across what they did, they said things like, “because it was there.” But I feel an opposite urgency, to see the wild places before they are gone. This was all here long before I was, and it can be here long after I am gone. But bearing witness is not enough. 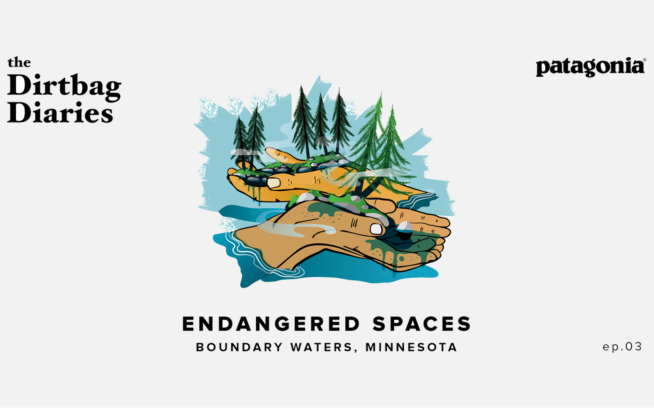 To save the Boundary Waters, we must also act. Emily Meg Weinstein is an essayist and blogger. Her work has appeared in Climbing, Salon, Adventure Journal and other publications. An expatriated New Yorker, she now lives in northern California, where she divides her time between a houseboat in the San Francisco Bay and her second home, SubyRuby the Devastation Wagon.